Dublin, November 10th, 2015; An independent report by EY (Ernst Young), published today, outlines opportunities that would be created for residents and businesses in Dublin 8 (and parts of Dublin 12) as a result of the decision to locate the new children’s hospital (nch) on a campus shared with St. James’s Hospital. 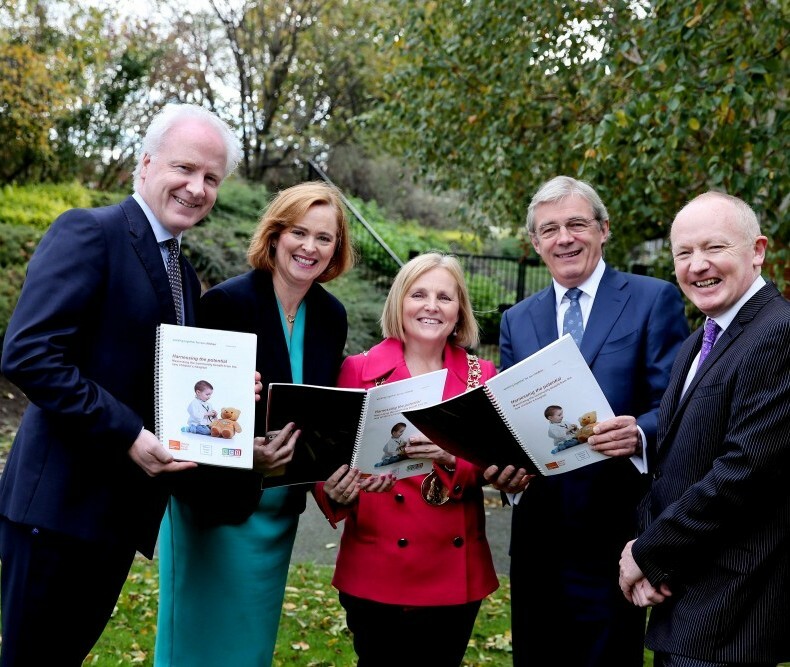 The Report was commissioned by a Community Benefits Oversight Group which was established by the National Paediatric Hospital Development Board (NPHDB) and the Children’s Hospital Group (CHG), to ensure that the impact of the €650 million investment could be maximised in the short, medium and long term for the local community. The Oversight Committee is chaired by Gordon Jeyes. Putting in place a programme to ensure that the full benefit of having a world-class hospital in the community is realised is a priority objective for the NPHDB and CHG. The Community Benefits Oversight Group incorporates all of the relevant stakeholder groups in the community to endure that all opportunities are fully leveraged. Members include; St. James’s Hospital; Dublin City Council; Department of Social Protection; CDETB; HSE; An Garda Síochána; Community groups; Local regeneration boards; and an independent Chairman. The overarching objective of the Oversight Group is to promote active engagement between local community interests and the hospital project so that the community benefits in terms of health, training, career opportunities and local business development. Research was conducted by EY to identify employment, education and enterprise opportunities that would arise during the design, build, and operational phases of the hospital. A full skills audit of the local community was undertaken to identify education and employment supports that are available or required to assist unemployed people secure employment through the project. Consideration was also given to how social clauses could be used when construction ends. Employment and education programmes: Internships, job placements and labour activation programmes will all be used during both the construction and operational phases. These will leverage existing community and state supports but will be tailored to maximise the opportunities from the project. Schools programmes will be rolled out to encourage children to consider medical or support roles from an early age. Enterprise Support: Direct demand for goods – e.g. Cafes and restaurants – potential for spin off companies – procurement support for small business, online knowledge portal. Procurement and use of social clauses: Maximising the potential of social clauses in both the construction phase and in the operational phase. Community and awareness raising: Raising awareness of educational opportunities; driving the message among suppliers, local organisations and the community to ensure that the community is ready for the opportunity with the right skills and the right structures to maximise the potential – proactive programmes to help create a ‘Healthy Community’. A first step in ensuring that this strategy becomes a reality has already been taken with the appointment of a full-time Community Benefits Champion who will drive the implementation of the recommendations. The identification of future employment opportunities and the skills profile required to fill those roles has commenced. Work is underway with local training providers to respond to the skills gap with existing databases being used as a source to identify potential candidates. All stakeholders will continue to work in partnership to monitor the types of opportunities and business development needs that might arise to ensure that the potential of this project is harnessed for the community within which it is based. The new children’s hospital on a campus shared with St James’s Hospital is the largest and most significant capital investment project ever undertaken in healthcare in Ireland. Its completion will result in better clinical outcomes, improved survival rates for the sickest children and young people and will significantly enhance the experience of service for children, young people and their families. It will bring together the three existing children’s hospitals; Our Lady’s Children’s Hospital Crumlin, Temple Street Children’s University Hospital, and the National Children’s Hospital at Tallaght Hospital. As the nexus of an integrated model of paediatric care throughout Ireland, the nch will support paediatric acute services nationally through outreach to ensure children are treated as close to home as possible. Transition of services to the new hospital is expected to commence at the end of 2018. The hospital will be co-located on one campus with St James’s Hospital and in time, tri-located with the Coombe maternity hospital. This tri-location model of service delivery is being undertaken to ensure the best outcomes for our sickest children and young people, for mothers and for infants. It will be an academic health sciences hospital that values world-class research, education and innovation, which in turn will drive excellence in clinical care. The new children’s hospital will be a world-class facility providing secondary paediatric services for the greater Dublin area, and specialist services for the country as a whole.